AR.FlyingAce is a game of air combat in augmented reality. It takes place between two AR.Drone armed with Plasma missiles. The game’s objective is to virtually shoot down the opposition AR.Drone. Check out the trailer after the jump to take a taste of this unique game. Each AR.Drone has an unlimited number of missiles. Once the AR.Drone enemy has been detected by the camera, a red cross-shaped timekeeper appears on the screen and the iPhone / iPod touch / iPad begins vibrating. 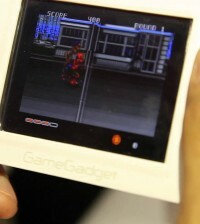 The driver then has to shake his iDevice to activate the sending of a missile towards the other fighter. The missile trajectory will be visible in augmented reality on the screen of the iPhone / iPod touch / iPad until its impact on the enemy AR.Drone. Life bars of both AR.Drone are displayed on the sides of pilot screens, the bar on the right corresponding to the opponent. If the level ends before either player has lost his virtual life, the winner will be the one with the highest life bar. Game will be available on 27 April on the App Store.